It is not in this area, but the warning must still apply to anyone who let's their dog off the lead in the vicinity of sheep. A Sussex farmer has been left heartbroken after more than one hundred of his sheep died in the UK's worst dog attack in living memory. The horrific discovery was made by farmer Gordon Wyeth at the West Dean Estate, Chichester early on Monday afternoon (March 7). The sheep, many of them pregnant, had been herded into a tight group against a fence and gate bordering woodland where they had panicked and had either died from shock or by being crushed in the flock. 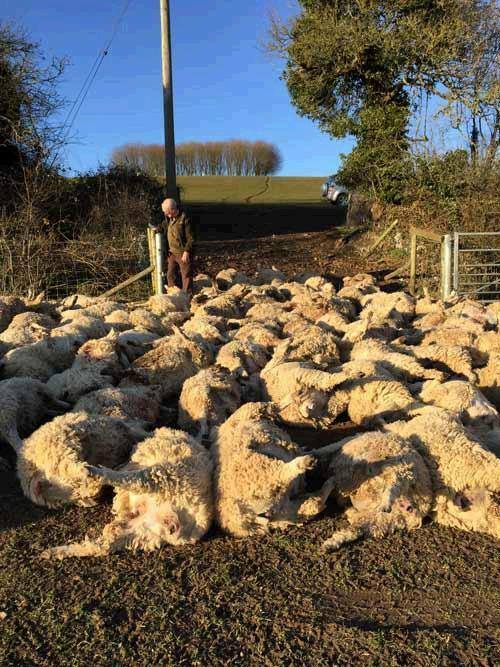 A total of 116 sheep, worth about �17,000, died in the field just north of the A286, near the old railway bridge at the eastern end of the village. Sergeant Tom Carter from Sussex Police said: "I have never seen or heard of sheep-worrying on this scale before and this was a terrible sight. While there are no signs of any of the animals being savaged, we are all but 100 per cent certain that their deaths were brought about by dogs. It may well have happened in daylight and we want to hear from anyone with information about it. "This is not just about the Mr Wyeth's livelihood - and it will cost him at least another �2000 to dispose of the carcasses - but also his emotional attachment to the animals that he has raised and nurtured." 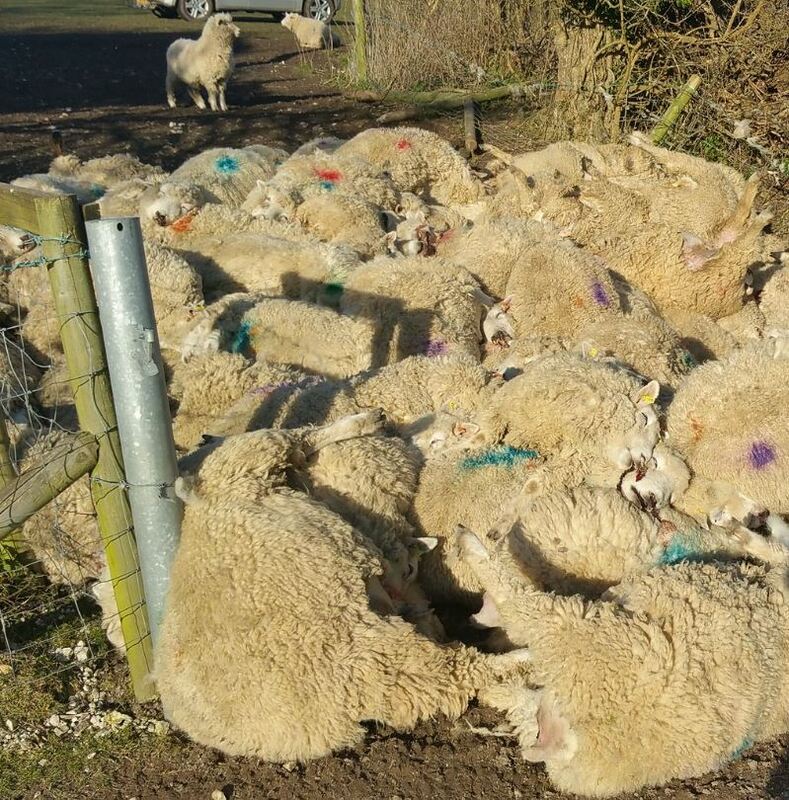 Sgt Carter continued: "We have seen a rise in sheep-worrying incidents and as Spring approaches more dog owners will be heading for the countryside to exercise their pets. We urge people to keep their dogs on a lead while they are walking in rural areas and around livestock. So often in these incidents the owners are horrified by what their dogs have done, but they have to accept that even the most docile of pets can quickly turn into a killer given the opportunity." Presumably it must have been a long sustained harrassment of the sheep if theres no marks on them . Could be multiple dogs too , it wasnt witnessed. Who knows, could even have been some yobs with a drone terrifying them. Dreadful incident for the poor sheep, and a financial shock for the farmer. Who knows, could even have been some yobs with a drone terrifying them. As awful as it is cant the sheep be sold for meat to offset cost? Presume some law saying they have to be killed properly in an abattoir. Some little scroats sitting somewhere bragging about their deed. Lambs are sold for meat not the ewes. The ewes are kept for breeding. whats mutton--just old rams? or ewea past breeding? Yep, lamb has to be under 12 months old, and from what I've seen usually about 7/8 months. Mutton has to be ewes over 2yrs old and also castrated rams. The more I think about it, the more it upsets . Mutton is popular amongst the halal diets. Poor creatures which ever way we look at it. Controlled by humans fancies, we don't even need it. We think the of what ISIS does is despicable, but we do exactly the same for food. All living creatures feel pain and fear. Off to have a weep now . Night. Last edited by granny; 13th Mar 2016 1:07am.